Summary: A dreadful eruption is close! Mt Teresa has become very unstable yet many of the inhabitants of the mountain are refusing to leave. It is thought that all may be destroyed when it goes off. There is increasing evidence that Mt Theresa is close to experiencing a serious eruption. In Bali, worries about Mt Agung have led to the evacuation of more than 130,000 people. In Manchester, in contrast there are apparently some who still cluster around the desperately unstable mountain. The smaller creatures are unsure whether to run or stay but the bigger beasts continue to hope they might survive the eruption and take over the commanding heights of whatever remains after the eruption. By nice coincidence it is exactly 50 years since Dan McKenzie from Cambridge published his theory of plate tectonics, now widely accepted. He showed that the movements of the surface of the earth cause dreadful damage when the plates intersect. This is what is happening now in Manchester. Groups of creatures called “Hard-Brexiteers” are battling against “Soft-Brexiteers” with occasional mutterings from the “No Ruddy Brexit at all-eers”. It is feared that many will perish. The Labour Party, traditionally strongly against blood sports, seem remarkably sanguine having set up remote terraces from which to view the impending bloodbath. They have decided that this is the time to keep quiet and enjoy the spectacle which should be most impressive. When the wrath of the gods threatens it is traditional for some to try appeasement, refusal to countenance that the status quo might not go on forever. Today we have James Brokenshire trying to placate a strange subset of the local population thought to have short-term magical powers. They are known as the DUP and are being threatened with having a budget set for them if they don’t sort out their problems. 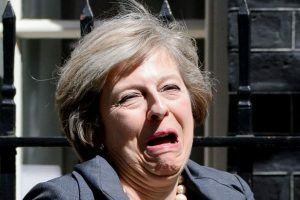 With a bit of luck, the DUP might go up with Mt Theresa. One large rather fluffy animal, the Boris, tries to assert his capacity to maintain the mountain intact if he is allowed to climb to the top. Others, particularly amongst the younger creatures of the party are distrustful of his motives. They understand him to be the buffoon he proves himself whenever he goes overseas where he delights in annoying all he meets. Many say he should be thrown off the mountain to his doom. Another, less well nourished, is called Chancellor. In a delicious example of “pot calling frying pan black”, he has just accused Labour leaders of being dinosaurs. However it is believed that the extinction of dinosaurs was a consequence of not realising they were dinosaurs in the first place. However almost all the bigger animals are finding it very hard to get any traction on the slippery slopes of the Mt Teresa. Her certainty she is in control is increasingly difficult to sustain. Labour believes most will be consumed in the flames and that the Tories will have to wait for a generation before their tribe grows and gains strength for the future.